Cigna has released their 2017 health plans available in select counties of Northern and Southern California. Cigna has decided not to pay agents commissions for 2017. (Cigna Cuts All Agent’s Commissions to 0% for 2017) Consumers will have limited options for assistance with enrollment and the explanation of the health plans from Cigna in 2017. Most all Cigna plans have been converted to EPO plans. 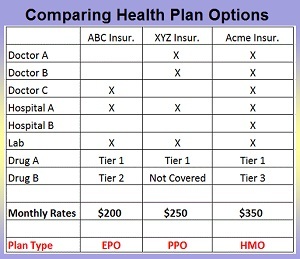 The exception is one Bronze plan that still remains a PPO product. Cigna has filed their 2017 California individual and family plan rates with the California Department of Insurance requesting overall rate increase of 18%. Cigna’s rate filing states the new 2017 health insurance premiums would affect 18,253 of their members in California. The Department of Managed Health Care (DMHC) invites you to a public meeting on the acquisition of Cigna by Anthem Blue Cross. Representatives from both plans will be present. The meeting will be held in Sacramento on March 4, 2016 from 1:30 p.m. to 3:30 p.m. The purpose of the meeting is to discuss DMHC’s jurisdiction and authority to oversee the transaction and to solicit public comment for DMHC’s consideration as it reviews the transaction. Public comment will be limited to 3 minutes. Comments may also be submitted to [email protected] until 5:00 p.m. on March 11, 2016. The Centers for Medicare and Medicaid Services (CMS) issued an immediate suspension of enrollment and marketing activities for Cigna-HealthSpring Medicare Advantage plans on January 21, 2016. The immediate intermediate sanctions against enrollment and marketing activities to Cigna, HealthSpring, and Bravo Health Medicare Advantage plans sold in the states of Alabama, Arizona, Tennessee, Georgia, Pennsylvania, South Carolina, North Carolina, and Florida. The CMS sanctions were imposed on Medicare Advantage medical plan which include prescription drug coverage also known as MA-PDs. Cigna has announced they will be sending letters out to individuals newly enrolled in their health plans in 2016. The letters requesting verification of identity, residency, and premium payment will be sent to Cigna Individual and Family health plan enrollments regardless of whether the plan was purchased either through a Market Place Exchange or off-exchange directly from Cigna. If Cigna doesn’t receive the requested information within 45 days the health insurance may be cancelled. Cigna will be discontinuing some off-exchange plans the following plans and moving current members to an equivalent health plan. The marketing term “myCigna” preceding 2015 non-standard benefit design plans is being dropped on some plans, but the overall benefit design will remain the same. For example, myCigna California Platinum will now be called Cigna California Platinum.